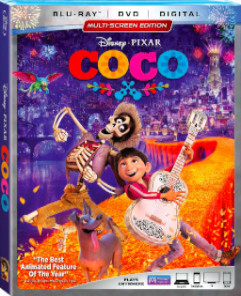 Enter our giveaway for a chance to win [COCO]! THIS SWEEPSTAKES IS OFFERED ONLY IN THE 50 STATES OF THE UNITED STATES ("U.S."), AND THE DISTRICT OF COLUMBIA ("D.C."), AND IS INTENDED FOR PARTICIPATION IN THOSE AREAS ONLY. PLEASE DO NOT PROCEED IF YOU ARE NOT AT LEAST 18 YEARS OF AGE OR OLDER AND A PERMANENT LEGAL RESIDENT OF ONE OF THE 50 STATES OF THE U.S., OR D.C. THIS SWEEPSTAKES SHALL BE CONSTRUED AND GOVERNED ACCORDING TO THE LAWS OF THE U.S. ELIGIBILITY: Open only to legal residents of the 50 United States and the District of Columbia (excluding Guam, Puerto Rico and all other U.S. and foreign territories and possessions), who are physically located and residing therein and are 18 years of age or older at time of entry. If an entrant is a resident of a jurisdiction that deems him/her to be a minor, he/she must obtain parental/legal guardian consent prior to entering or submitting any personally identifiable information. Employees, officers and directors of TheaterByte ("Sponsor") and their parent, subsidiaries, and affiliated companies, advertising, promotion, and production agencies, those involved in the production, development, implementation or handling of the Sweepstakes, (collectively "Sweepstakes Entities") and members of their immediate families (spouses, children, siblings, parents) are ineligible to participate in the Sweepstakes. HOW TO ENTER: The Sweepstakes starts on or about February 26, 2018 at 03:00 p.m. Eastern Time (ET) and ends on Mach 5, 2018 at 03:00 p.m. ET (the "Sweepstakes Period"). To enter visit https://www.theaterbyte.com/contest/coco and follow the instructions to complete the official online entry form ("Entry"). All required Entry information must be completed in full and must be accurate, current, true and valid. The Entry information must match the information of the entrant that completed the act of physically entering the Sweepstakes. If an entrant’s contact information changes after he/she submitted his/her Entry, it his/her responsibility to contact the Sponsor at https://www.theaterbyte.com.contact and provide his/her new Entry information (to be received within 2 days of the Sweepstakes end date). Entries must be received by 02:59:59 p.m. ET on March 5, 2018. Sponsor's computer is the official clock for purposes of Sweepstakes participation. Limit one (1) entry per person or e-mail address. Entries submitted from the same person in excess of the stated allowance, including original entry form and subsequent additional engagement entries, will be disqualified. Any attempt by an entrant to obtain more than the stated number of entries by using multiple/different email addresses, identities, registrations, logins or any other methods including, but not limited to, commercial contest/sweepstakes subscription notification and/or entering services, will void that entrant’s entries and that entrant may be disqualified. Proof of delivery or receipt of an Entry will not be deemed by Sponsor as proof of entry. Any attempted form of participation in this Sweepstakes other than as described herein is void. Final eligibility for the award of any prize is subject to eligibility verification as set forth below. The Website may not be accessible from all mobile phones, handheld devices and/or tablets. If an entrant experiences any issues entering, he/she should access the Website from a desktop or laptop computer. Sponsor and Sweepstakes Entities are not responsible for lost, late, mutilated, misdirected, illegible, incomplete or postage due mail or entries. No facsimiles or mechanical reproductions of entries allowed. Sponsor and Sweepstakes Entities are not responsible for unauthorized human intervention, phone, technical, network, electronic, computer, hardware or software failures, malfunctions or disconnects of any kind (including but not limited to problems/errors in the product registration process), or misdirected, illegible, incomplete, stolen, garbled, fragmented or delayed Internet/e-mail computer transmissions or network/ISP/website Internet accessibility/availability; or for inaccurate, incorrect or incomplete capture of information, regardless of cause. Should multiple users of the same e-mail account enter the Sweepstakes and a dispute thereafter arise regarding the identity of the entrant, the authorized subscriber of said e-mail account at the time of entry will be considered the entrant. "Authorized account subscriber" is defined as the natural person who is assigned an e-mail address by an Internet access provider, on-line service provider or other organization which is responsible for assigning e-mail addresses or the domain associated with the submitted e-mail address. All entries become the exclusive property of the Sponsor and none will be returned or acknowledged. RANDOM DRAWINGS: One (1) potential grand prize winner will be randomly selected from among all eligible Entries received. The potential winner will be selected in a random drawing within 4 weeks of the Sweepstakes end date. The potential winner (or his/her parent/legal guardian if he/she is a resident of a jurisdiction that deems him/her to be a minor) will be notified by e-mail If a potential winner cannot be reached after a reasonable effort has been exerted, if he/she is found to be ineligible, if he/she cannot or does not comply with these Official Rules, or if his/her prize or prize notification is returned as undeliverable, such potential winner will be disqualified, and an alternate potential winner for such prize may be selected at Sponsor’s sole discretion. Sponsor, whose decisions are final and binding in all matters relating to the Sweepstakes, will conduct the drawing. By participating, entrants agree to abide by and be bound by these official rules. PRIZE CONDITIONS: Prize cannot be transferred, assigned, or redeemed for cash, but Sponsor reserves the right to substitute a prize with equal or greater value should the prize become unavailable for any reason. All federal, state, local, and other taxes on or in connection with any Prize (including on purchase made with any Prize), all tax reporting consequences and all expenses not listed herein related to acceptance and use of any Prize, are the sole responsibility of the winner. Any depiction of the Grand Prize or prize components, in Sweepstakes materials or otherwise, is for illustrative purposes only. Sweepstakes Entities are not responsible for any cancellations, delays, diversions or substitutions, or any act or omission whatsoever with respect to the prizing. Limit one (1) prize per person/e-mail address. ODDS OF WINNING: Odds of winning depend on the total number of eligible entries received. RELEASES: By participating, entrants agree that Sponsor, Sweepstakes Entities, their parent, subsidiaries and affiliated companies, advertising and promotion agencies, and all of their respective officers, directors, employees, representatives and agents will have no liability whatsoever for, and shall be held harmless against any liability for any injuries, losses or damages of any kind to persons, including death, or property resulting in whole or in part, directly or indirectly, from acceptance, possession, misuse or use of any prize or participation in this Sweepstakes. Except where legally prohibited, winners grant (and agree to confirm that grant in writing) permission for Sponsor, Sweepstakes Entities and those acting under their authority to use winner’s name, photograph, image likeness, statements, biographical information, voice, voice likeness and city and state address for advertising, publicity and promotional purposes without additional compensation in all media now known or hereafter discovered, worldwide without notice, review or approval. GENERAL CONDITIONS: Any form of Internet/e-mail participation other than as set forth in these Official Rules is prohibited. Use of automated, robotic, programmed and like methods of on-line participation are prohibited. Persons who tamper with or abuse any aspect of the Sweepstakes or website, or who are in violation of the Terms and Conditions of Use of the website, as determined by the Sponsor in its sole discretion, will be disqualified. Sponsor may also prosecute such persons to the full extent of the law. Should the Sweepstakes be, in Sponsor's sole opinion, compromised by virus, worms, bugs, non-authorized human intervention or other causes which, in the sole opinion of Sponsor, corrupt or impair the administration, security, fairness, proper play, or submission of entries for the Sweepstakes, Sponsor reserves the right at its sole discretion to suspend, modify or terminate the Sweepstakes. In such event, winners will be selected in a random drawing comprised of all eligible entries received prior to and/or after (as appropriate) the action taken by Sponsor. Sponsor and its agencies are not responsible for any incorrect or inaccurate information, whether caused by website users, tampering, hacking, or by any equipment or programming associated with or utilized in the Sweepstakes, and assumes no responsibility for any error, interruption, deletion, defect, delay in operation, or transmission, communications line failure, theft or destruction, or unauthorized use of the website. ENTRY INFORMATION: Personal information collected from entrants during the Sweepstakes is subject to Sponsor's privacy statement available at http://www.theaterbyte.com/privacy-policy and, except as otherwise provided in these Official Rules, will be treated in accordance with the terms of that statement. Information collected from entrants in connection with this Sweepstakes will be used by Sponsor and/or Sweepstakes Entities for purposes of administering the Sweepstakes and the fulfillment and verification of Prize awards. Sponsor may engage certain third-party companies to perform services in connection with the administration of this Sweepstakes and information provided by entrants may be collected and used by those third parties for purposes of administering the Sweepstakes and/or the fulfillment and verification of Prize awards. WINNERS LIST/OFFICIAL RULES: For a copy of these Official Rules or the Winners List email sweeps@theaterbyte.com with the subject line “Official Rules Request – Coco” or “Winners List Request– Coco” respectively. Winners list must be requested within 90 days of the end date of the Sweepstakes.